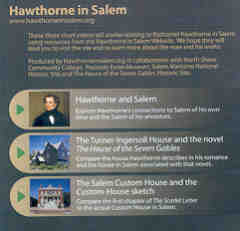 Order a Hawthorne in Salem DVD with three videoclips of approximately seven minutes each. The first video, Hawthorne and Salem is an exploration of Hawthorne's connections to the Salem of his own time and the Salem of his ancestors. The second, The Turner-Ingersoll House and the novel The House of the Seven Gables, compares the house Hawthorne describes in his romance and the house in Salem associated with that novel. The third, The Salem Custom House and the Custom-House sketch, compares the first chapter of The Scarlet Letter to the actual Custom House in Salem. Payment is by credit card (Mastercard, Visa, or Discover), and orders should be placed by calling the NSCC Bookstore (978) 762-4046, by sending a fax to (978) 762-4024, or by sending an email to Shawn Cronin (scronin@northshore.edu). If you have further questions, contact Terri Whitney (twhitney@northshore.edu).